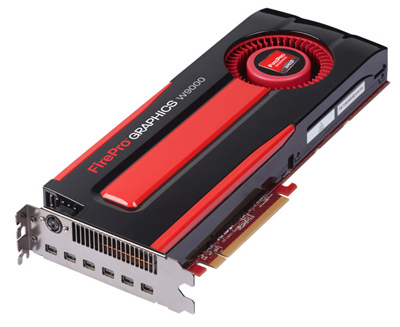 The AMD FirePro™ W9000 is the industry’s most powerful professional graphics card available for CAD/CAE and Media & Entertainment professionals. It’s up to 3.9 times faster than competitive solutions in single precision compute performance, due in part to its innovative all-new Graphics Core Next (GCN) architecture that allows it to effortlessly process challenging compute workloads. In addition, the 3D primitive graphics performance is up to 1.5 times faster than equivalent competitive offerings, delivering better interactivity when working with complex models and faster render times.